Chris Owings is the kind of athlete you want to root for. The Visalia Rawhide’s star shortstop is articulate, humble and obviously loves doing what he does – which is tearing up the Cal League. I recently had the opportunity to ask Chris a few questions. Larry: First of all, please tell us about where you grew up. Chris: Gilbert is a really small town. It’s one of those places where everybody knows everybody. I couldn’t have asked for a better place to grow up. All of the people are really nice and there is a great sense of community. It was great because I pretty much lived on the same street as most of my relatives. My grandparents, aunt, uncle, and cousins…we all pretty much lived together. Larry: When did you get interested in sports? Chris: I was interested in sports at a really young age. I had older brothers, so I always tried to compete with them at anything I could. We would go outside and play all of the time after school and on the weekends. We could spend all day outside no problem. I played little league growing up, but I really started taking baseball seriously once I hit high school. Larry: Was baseball your number one sport as a kid, and did you also play other sports in school? Chris: Once I got into high school, it was all about baseball. I had a knack for it and I decided to focus all of my efforts in baseball because I knew it was something that I was good at. Larry: Who were the athletes you looked up to as you were growing up? Chris: I was an Atlanta Braves fan growing up, I guess I still am. But I love Chipper Jones. He’s the man. He’s an ageless wonder and has had an incredible career. I loved watching him play when he was in his prime. Larry: When did you realize that you had the skills to be a professional baseball player? Chris: I would say when I got to my freshmen year of high school and I got to play on the Varsity team. In tryouts, I was just a lot better at certain things than a lot of the other kids were. Once you start getting support and encouragement from your family and your coaches, it makes you that much more confident in yourself that you can do whatever you want. But it didn’t really become a reality until scouts started to come watch me play and they started telling me how I could end up being a top draft pick. That’s when I knew that being a pro ball player was something that I could really pursue. Larry: What was it like to be drafted by a major league baseball team? Chris: It was unbelievable. It was a dream come true without a doubt. I was with my whole family when I got drafted and everyone was just so happy for me. Next to winning two state championships in high school, it is probably one of the highlights of my baseball career. Larry: Shortstop is perhaps the most demanding position to play. What goes in to making a good defensive shortstop? Chris: I always saw the catcher and the shortstop as the two main defensive leaders on the field. And I think to be a good shortstop you have to be a good leader. You have to be the anchor on defense. When you make good plays and you are reliable, the whole team plays better. Your pitchers will have more confidence in the defense and they will make better pitches. It is a tough position, but I wouldn’t want to play any other position. Fielding groundballs and turning double plays are my favorite. But when it all comes down to the position, I just think it comes down to being a good leader for your team. Larry: Looking at your offensive stats, I notice that you are a .300 hitter against both right handers and left handers. How did you become so consistent as a hitter? Chris: Just working hard every day in the cages with Cruz and the other coaches. I don’t really like to look at batting averages, statistics and all that stuff. If you work hard, all of that will just take care of itself. Every at-bat, you have a job to do…whether it be moving runners over, driving guys in or just getting on base. 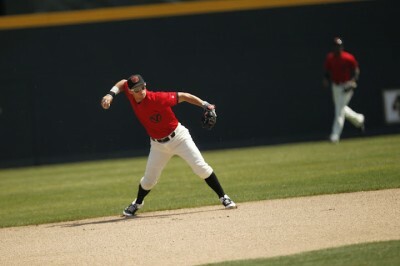 I just try to play situational baseball and do my job the best I can possibly do it every time I step up to the plate. Larry: You’ve been a very productive hitter at every stop along the way in your career. Is it just a lot of BP that goes into being a good hitter, or are there other intangibles? Chris: It’s a lot of work like I said. And a lot of it is just being patient. You are going to have days…weeks where you will inevitably struggle. You just have to keep going and try to forget about all of the obstacles and move onto the next at-bat. If you keep working hard, over a long enough sample size, you’re going to succeed. Larry: People look at pro baseball players and think they have it so easy–getting to play a game for a living. It always looks easy from the outside. What’s the hardest thing about being a pro baseball player? Chris: Well first of all, I am extremely blessed to be doing what I do. I get paid to play a game that I love, a game that is made for kids. So you can say that we do have it good. But by no means is it easy. If you want to have the privilege of playing at this level, it takes a lot of work. You’re going to have to do a lot of things that you might not consider fun things to do. The whole baseball season is a major grind on you physically, emotionally, and mentally. Hours and hours of hard work has to be put in before you can even step foot onto the diamond for a game. A lot of that work isn’t going to be fun and it isn’t going to be something that you like necessarily. I think sometimes fans forget that. But when you get to come in and hang out with the guys and compete everyday, it makes it all worth it. Larry: How do you like Visalia so far? Chris: I’ve been here well over a year now, and I think it’s great. Some people here consider it small, but it is a lot livelier than what I am used to back home. But the people are nice and the fans are great and I like playing at the ballpark. It’s a fun environment. You don’t get that kind of environment at a lot of minor league parks. Visalia fans should consider themselves lucky for having such a rich baseball environment to take advantage of. Larry: What are your goals for the future? Chris: Continue to work hard everyday until I get to where I want to go. I want to play at the Major League level, obviously. But even after that, I know I can’t become content or satisfied. Because the minute I do, there is another player right behind me waiting to take my job. It’s a very competitive business. My immediate goal is to move up, but if I eventually get to the Majors, I just want to be the best player that I can possibly be. It usually isn’t appropriate to get ahead of ourselves, but let me say this – get out to Recreation Park in Visalia and watch Chris Owings while you can, because at the rate he’s going, he’s not going to be in “A” ball much longer. And we have a very real chance of seeing him playing for the Arizona Diamondbacks in the near future. Many thanks to Chris and everyone at the Rawhide for help in this interview. To find out when you can go see the Rawhide play, check out their KRL event page.